After doing a fertilizer deep dive, we’ve come to the surface and found that the best tomato fertilizer is the Espoma Tomato Tone Fertilizer. Not only does this product come with a balanced NPK formula, but it is an organic option that can be used with many other vegetables and fruits as well. For more information on the Espoma Tomato-Tone fertilizer, see the Product Reviews section below. The runner-up for tomato fertilizer is the Greenery Biotech Tomato Fertilizer. While a bit expensive, it works quickly and can also be used safely in hydroponic systems. It also contains a powerful NPK formula which works to help keep your tomatoes healthy. For further details on the Greenery Biotech Fertilizer, see the Product Reviews area below. 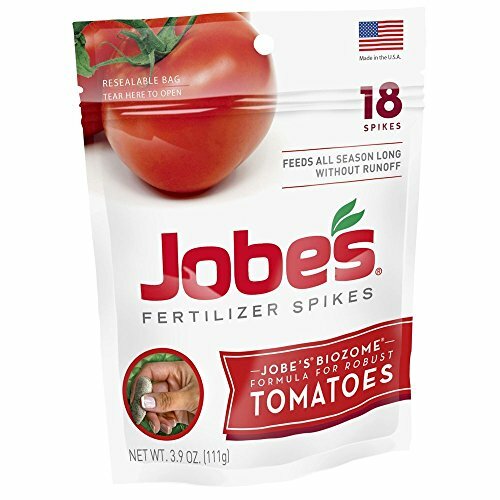 The best budget pick tomato fertilizer is Jobe’s Tomato Fertilizer Sticks. These are not only affordable but are ideal for those who are just starting out with growing tomatoes. These sticks can work with supplying the plants nutrients for up to eight weeks making it a great investment. To learn more about Jobe’s Tomato Fertilizer Sticks, check out the Product Reviews area below. There are a variety of benefits that come with using tomato fertilizers. Below are a few your tomatoes will enjoy. Tomato fertilizers can help with ensuring your plants stay healthy. This means you won’t have to worry much about blossom rot, blight, wilt, and other common tomato plant diseases from occurring. Unlike many fertilizers which tend to contain harmful chemicals in them, most tomato fertilizers are safe to use. So, you won’t have to worry about these chemicals seeping into the tomatoes or creating dirty runoff that can affect other plants. Another interesting benefit about tomato fertilizers is that they can help improve overall soil health. This is because they will provide many nutrients that encourage healthy soil which in the end will not only help your tomato plants to grow well, but many other plants as well. It is almost always beneficial to replenish the nutrients in your soil before you’ve planted anything! Often compost, especially something like a lobster compost or worm compost, will provide a great basis for healthy plant growth. If you haven’t considered composting, you may want to do so, either with a worm composter or perhaps a compost tumbler. Both will produce excellent tomato food! From there, adding fertilizer before planting can give early seedlings a boost and get your tomato season hopping. Of course, those who are growing hydroponically can fertilize their plants literally constantly, but we assume most will be growing tomatoes in pots or in raised garden beds. Depending on the circumstances of your soil, it can often be helpful to fertilize in small amounts, at regular intervals. This would perhaps be every other day or every few days. As the season reaches its growth peak in early-mid July, you’ll likely want to cease your fertilization. The plants will continue to grow rapidly, but the new growth will be less hardy, and more succeptable to cold temperatures when the weather changes. Calcium is crucial when it comes to healthy tomato plants. This nutrient not only helps to provide strong stems and fruit, but prevents the common blossom rot that often plagues tomatoes. It also helps to prevent diseases from wreaking havoc on your plants. An important thing to look at is the fertilizer’s NPK formula. NPK (Nitrogen, Phosphorus, and Potassium) are vital nutrients that tomato plants need in order to grow and produce fruit. As you’ll find with most fertilizer products, the NPK formula will vary. Ideally, you should look for a fertilizer that is close to a 10-10-10 ratio. However, these levels will vary depending on numerous things and the right ratio for you depends on your needs. For instance, if you want large tomatoes, a high potassium level is ideal. On the other hand, if you want a bountiful harvest, you’ll want to check for high nitrogen levels. Additionally, much depends on the existing circumstances in your soil. You may want to pick up a soil test kit and/or a soil moisture meter to keep track of the status of your soil and get informed as to what you’re going to be growing with. Often gardeners get great plant growth, but the *@&$ tomato plant won’t produce any fruit! If this is happening to you, likely you’ve got excess nitrogen in your soil, and you’ll want to pick a low-nitrogen fertilizer. Most of the fertilizers we examine in this article are relatively low-nitrogen. Again, a soil test kit and moisture meter can help gardeners zero in on these circumstances, and fix them before they get out of hand. Sometimes tomato fertilizers can be used safely with other plants, like melons and peppers. This will not only help to save you money in the future but can make it easier for you to spread the fertilizer as you won’t have to keep changing products or protecting certain plants from it. We’re focused on tomatoes in this article, but it is helpful to keep in mind that these fertilizers may be appropriate for other plants as well. Some of the fertilizers on our list are powders that get sprinkled around the plants, others get mixed with water, and some are simply inserted in the ground near the plants. All of these application methods have advantages and disadvantages. Generally, the easier the application method, the better. You’re less likely to over-fertilize your plants with, for example, sticks, due to mistakes in measurement and application. Sometimes fertilizers take a little bit of time before you start to see results. On the other hand, some fertilizers work very quickly. If you want a quick harvest, you’ll want to pay close attention to how quickly the fertilizer works. However, keep in mind that faster isn’t always better. Fast-working fertilizers might give you more tomatoes, but slower fertilizers more than likely will give you very plump ones. Another thing you should keep in mind is whether you want to invest in tomato fertilizer spikes, powder, or liquid. Spikes and liquid are usually ideal for beginners because they are pre-measured and don’t require as much work. However, sometimes they don’t work as powerfully as powder fertilizers and need to be replaced more often than powder fertilizers. It’s important to keep your needs and tomato growing abilities in mind so you invest in the right fertilizer. How Often Do I Need to Fertilize Tomato Plants? It depends, on your soil, conditions, starting environment, and the progress of your plants over time. Tomatoes grow rapidly and significantly over the course of a season, which can deplete the soil of nutrients. They often tend to need a lot of fertilizer in order to grow well. However, it’s important to check with the fertilizer you decide to use. It can be very easy to overdo the fertilizer, especially when it’s in powder form. This will not help your tomatoes like many might think, but rather harm them because they are receiving too many nutrients, and the balance between the nutrients may reach a tipping point. The right amount of fertilizer will be written on the product you buy and it’s important to follow the directions so the tomatoes grow well. Tomatoes are some of the most beloved vegetables to consume in the spring and summer. We love them, and love to try out different varieties each growing season. Not only do they come in numerous flavors and colors, but they are extremely healthy, versatile, and super-tasty food to consume. Because of this, they are perhaps the most popular vegetable for home gardeners to grow, but sometimes they run into a few problems. Tomatoes can be a little tricky to cultivate, which is why you need to use a good fertilizer with them. If you’re looking to up your tomato game and maximize your yield, you’ll need the right fertilizer, and you’ll need to use it the right way. We’ll take a look at five different high-quality tomato fertilizers here, and hopefully, give you some solid direction. We’ll start with a comparison table to get oriented, and then move into the individual reviews. We’ll conclude by touching once again on our favorites. Works to make tomatoes grow bigger. It features a 3-4-6 NPK formula. The bag weighs 18 lbs. The Espoma Tomato Tone Fertilizer is a quick solution to help encourage rapid growth with your tomatoes. It uses a special 3-4-6 NPK formula to help with growing plump tomatoes while also preventing the common blossom rot. It’s fairly light on nitrogen, which is helpful in many types of soil. This fertilizer also uses extra calcium to help with producing plenty of healthy tomatoes. 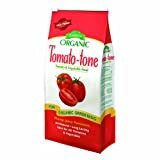 The Tomato-Tone fertilizer is a slow-release option, which means it will slowly release nutrients to your tomatoes over a course of a few weeks rather than all at once. This product can be used with potted and single plants as well as in tomato beds. You can additionally use it with peppers and melons. If you don’t mind spending a bit on tomato fertilizer, the Espoma Tomato-Tone Fertilizer is the best tomato fertilizer. It not only works quickly, but is extremely versatile and can be used with other plants as well. Better yet, it’s an organic option so there’s no need to worry about it releasing dangerous chemicals into the soil. And you don’t need to apply it constantly, as it has a time-release design. This means it’s pretty easy to use. This fertilizer has a 6-18-6 NPK formula. It comes in a waterproof bag. It comes with 18 fertilizer spikes. The bag weighs 4 oz. Jobe’s Tomato Fertilizer Sticks come in a waterproof 4 oz. bag and contain 18 spikes you can place into the soil. Generally, you’ll want to use two spikes per tomato plant. Simply stick them in the soil in proximity to the plant, and you’re good to go! These spikes contain a 6-18-6 NPK formula — again, a little light on the nitrogen, which is good in most circumstances. These sticks are designed to work with a time-release feature. This time-release feature will release nutrients for up to eight weeks before needing to be replaced. While it might be a bit slow, it’s an easy option to help fertilize your plants. This affordable option is a great choice for those who are new to tomato gardening. They are easy to use and don’t require much work making them perfect for those who want something simple and quick. The application is straightforward, and you don’t have to measure anything, mix anything with water, etc. Just stick ’em in the ground, and let the tomatoes grow! While they do require a little bit of time in order to work, they are well worth the wait. It has a 4-6-3 NPK ratio. There are probiotics blended into it. The bag weighs 4 lbs. 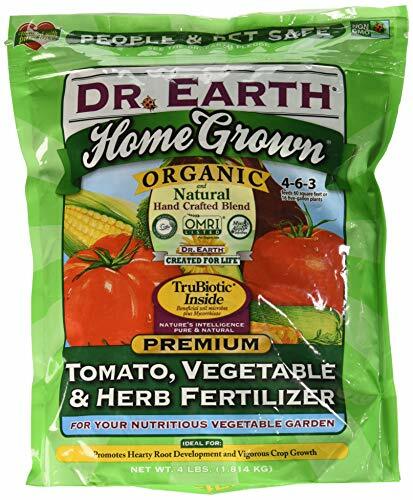 This organic fertilizer by Dr. Earth comes in a 4 lb. bag that features a 4-6-3 NPK ratio. Like the others we’ve looked at so far, it also has a low nitrogen ratio. This is typically good for tomato plants. The fertilizer formula contains many natural ingredients like fish bone meal, kelp, and alfalfa meal to help encourage rapid growth in a natural format. Dr. Earth’s formula also has probiotics mixed into it which helps to ensure your plants stay healthy. The fertilizer comes in a powder form so you’ll need to sprinkle it around the base of your plants. It’s pretty easy to apply and does not need to be mixed with water before application. It can work for months without needing to be replaced, and can also be safely used with ornamental trees. 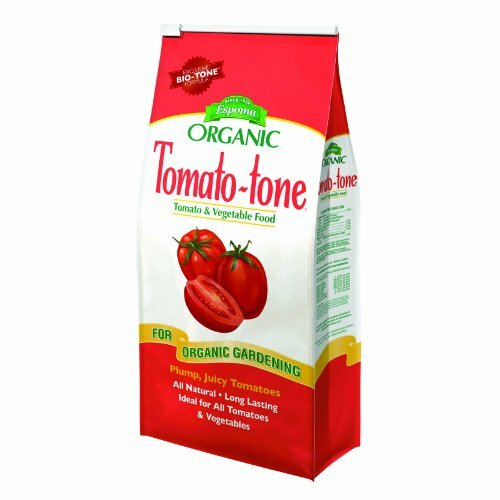 For those who are serious about finding the perfect organic option for their tomatoes, this fertilizer is a great choice. It contains not only natural ingredients, but probiotics to help encourage healthy and rapid growth. It has a shake and feed feature. The formula has extra calcium added to it. The NPK formula for this product is 8-2-12. The bag weighs 4.5 lbs. 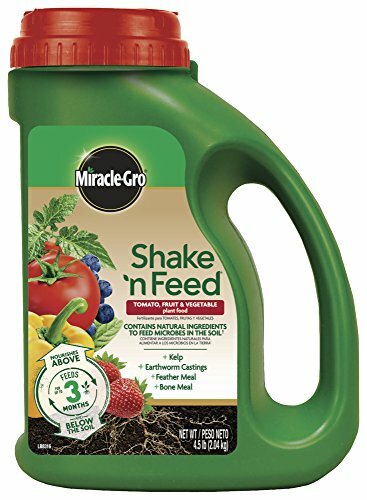 The Miracle-Gro Plant Release Fertilizer comes in a shake and feed bottle. It’s quite easy to apply, which is always a plus, and the Miracle-Gro brand is certainly a well-known option for plant fertilizers. As its name implies, you simply shake the fertilizer inside up and pour the pre-measured fertilizer out. This makes it a great option for those who want something quick and mess-free to use with their tomatoes. This fertilizer contains an 8-2-12 NPK ratio and has extra calcium added to it. This one is a bit higher in nitrogen than most of the fertilizers on our list, making it a great choice for those whose soil is lacking in nitrogen. The fertilizer can work for up to three months before needing to be replaced. You can use this product in both potted and in-ground plants. However, be careful to not over apply this product as it could end up causing too many nutrients in the soil. This can certainly harm your tomato plants. The Miracle-Gro Plant Release Fertilizer is ideal for those who don’t want to get messy while working in the garden. Its container pre-measures the necessary fertilizer for you and works for a few months before you need to give the plants more. Its NPK formula is also quite powerful which will help your tomatoes to be plump and plentiful, especially for those with low-nitrogen soil. Its NPK formula is 4-18-38. It comes in a powder form. It can be used with hydroponic systems. The bag weighs 5 lbs. 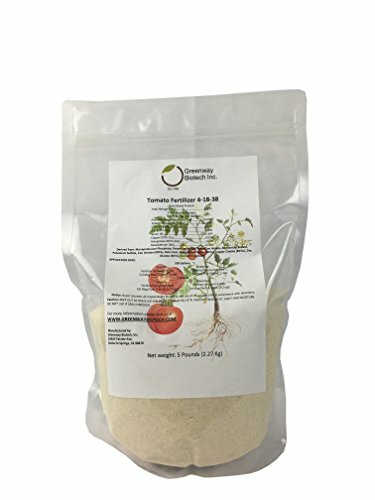 This tomato fertilizer by Greenway Biotech contains powerful micronutrients which go deep into the soil to help nourish your tomato plants. It comes in a powder form, though unlike the other powdered fertilizers, it is designed to be mixed with water prior to application. This fertilizer works great with hydroponic setups, making it somewhat unique among fertilizers on our list, but it works outstandingly in plant pots and typical soils, as well. The Greenway Biotech fertilizer has an NPK ratio of 4-18-38. Like most of the fertilizers on our list, this one is a pretty good ratio for most soil types, and is low in nitrogen. Greenway’s Biotech fertilizer does not contain heavy metals, so there’s no need to worry about harmful particles seeping into the soil. Besides potted plants, this product can be used with hydroponic systems, which is great for those experimenting with hydroponic growth systems. However, keep in mind that it’s a bit expensive and you need to spend some time mixing it into the soil. For those who don’t mind spending a bit on fertilizer, this is one option you’ll want to check out. Not only is the Greenway Biotech fertilizer able to be used with both potted plants and hydroponic systems, but it’s a natural option making it ideal for those who want something somewhat organic and natural to use with their plants. While you do need to do some hard work to mix it into the soil or water, this task is well-worth it. It is a powerful fertilizer. Growing tomatoes is not only satisfying, but can provide you with delicious fruit to enjoy in salads, sandwiches, and soups, pasta, pizza, and about a billion other dishes from virtually every cuisine style across the world. However, one of the biggest problems with growing tomatoes is making sure the fertilizer works well, and that you’re not over-fertilizing or under-fertilizing your soil. With this in mind, Our top pick, the organic Espoma Tomato Tone Fertilizer, has a solid NPK ratio with fairly low nitrogen and helps to keep plants strong and producing beautiful fruit. Our runner-up option, the Greenery Biotech Tomato Fertilizer, is versatile and contains strong micronutrients. If you’re into hydroponic gardening, this is a great option. On the other hand, if you’re looking for a simple, affordable option, you’ll want to keep in mind our budget pick, Jobe’s Tomato Fertilizer Sticks. These spikes are easy to use and can work for up to eight weeks. No matter which option you decide to use with your tomato plants, you can be sure they will help you achieve an incredible harvest.